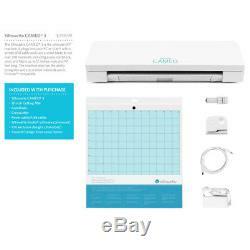 USCutter Business Craft Bundle: Silhouette Cameo 3, 15" x 15" Heat Press Machine. 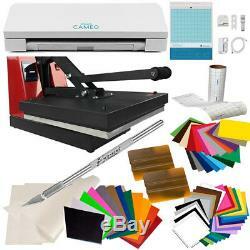 USCutter Business Craft Bundle: Silhouette Cameo 3, 15" x 15" Heat Press Machine, Supplies + Tools. The combination of Silhouette Cameo 3 and USCutter 15" x 15" Heat Press Machine opens up limitless crafting opportunities like paper crafts, signage and apparel decoration. Using USCutter 15" x 15" Heat Press rather than home iron makes a huge difference because heat press distributes heat evenly. This USCutter Craft Business Bundle is what you need if your goal is to turn your dreams and crafting skills into business. USCutter will proudly support you and your business. USCutter Craft Business Bundle includes the following items and their descriptions. Silhouette CAMEO 3 Electronic Cutting Machine. The Silhouette CAMEO® is the ultimate DIY machine. It uses a small blade to cut over 100 materials, including paper, cardstock, vinyl, and fabric up to 12 in. The CAMEO has the ability to register and cut printed materials and is PixScan compatible. What does this mean for you? It is our machine that has the largest cutting space and is most versatile in the materials it can cut. The Silhouette CAMEO® 3 has all of the same capabilities as the previous versions along with some added features. This CAMEO features a dual-carriage so you can use two tools at once, and it features Bluetooth® technology US, Canada, EU only. To top it all off, the CAMEO 3 is the only machine compatible with Silhouettes new AutoBlade. What's in the Box? Silhouette CAMEO® 3 electronic cutting tool. 15" x 15" USCutter Clamshell Heat Press Machine. This 15" x 15" clamshell heat press gives you a large area for t-shirt and fabric heat transferring. Clamshell heat presses save room over the standard swing arm heat presses and can be easier to manage depending on the set up of your workspace. Large Digital LCD Display - Preset desired time and temperature control with automatic alarm for precise operation. Ease of Use - Arrives fully assembled and ready for use right out of the box. Versatility - Apply designs to any flat surface, including fabric, metal, wood, ceramic, glass, and more. Full-range pressure-adjustment knob - Easily adjust the pressure according to the thickness of your transfer material. High density heating board with non-stick surface to prevent scorching. Heavy Duty - Commercial-grade, stable and supported by rigid steel frame which is built to last. Whole body - built from thick aluminum board. 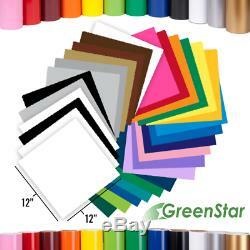 GreenStar 20 Sheets Indoor Vinyl Bundle - Assorted Colors, Matte Removable 12" x 12". GreenStar Matte Wall Vinyl is a flexible calendered film with an easy to remove pressure sensitive adhesive which has been specifically formulated for indoor applications, but can be use outdoors as well. This vinyl can be removed for up to 3 years from painted interior walls without damaging the paint or leaving any adhesive behind. 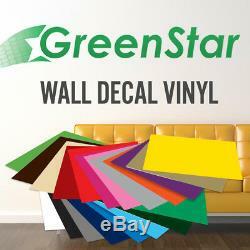 GreenStar Matte Wall Vinyl has a matte finish which prevents glare from direct lighting indoors and comes in 20 different colors. Though this material is made for indoor application it can also be applied outdoors for up to one year before showing any signs of weathering. This bundle includes the following 20 different colors of 12" by 12" sheets: 501 White, 502 Black, 505 Gray, 506 - Midnight Blue, 513 - Ocean Blue, 515 - Sky Blue, 517 - Forest Green, 519 Green, 521 - Lime Green, 524 - Daffodil Yellow, 530 Brown, 531 Beige, 536 Cranberry, 537 - Cherry Red, 540 - Hot Pink, 541 Pink, 544 Orange, 548 Plum, 550 Gold, 551 - Silver. GreenStar 6-Color Outdoor Vinyl Bundle 24-Sheet Pack, 12" x 12", 3mil. GreenStar Intermediate Performance Vinyl (IPV) is a 5-year calendered vinyl, custom-formulated for basic signage and banners. All colors come in a high gloss finish, with black and white also available in a matte finish. GreenStar IPV vinyl is great for general purpose interior/exterior graphics of all types including signs, banners, and window graphics. An excellent vinyl to cut, weed and transfer, GreenStar IPV vinyl has an outdoor lifespan of up to 5 years (3 years for metallic vinyl) and is made in USA. Hot color bundle includes the following colors (4 sheet/color). TransferRite 31GL Clear Medium Tack Application tape with Liner, 10 Foot Roll. Think outside the roll for transfer tape. Try new TransferRite 1310GL this is transfer tape on a liner for crafters and busy installers in their shops or on the go. New 31GL comes on a liner for crafters who dont need a whole roll of tape, installers who need to mask graphics on the go or in the field, as well as single operators in their shop who want to mask oversize graphics without the aid of rollers or other tape applicators. TransferRite 1310 (the most popular clear transfer tape on the market) has additional features for beginners, crafters, and professionals. TransferRite 1310G features a 1 pre-printed grid pattern for pre-measuring and aligning graphics. This alignment assistant is especially helpful to the inexperienced installer for accurately registering layering projects, small lettering, and other fine details, as well as for use as a measuring tool on a vehicle when designing auto wraps. 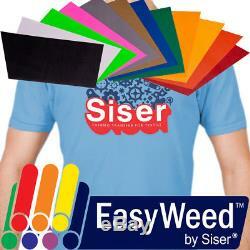 SISER EasyWeed Heat Transfer Vinyl, 15" x 12" 12 Color Starter Bundle. The Siser EasyWeed Starter Kit consists of twelve 15" by 12" sheets of Siser EasyWeed heat-transfer vinyl in the 12 most popular colors. A great way to get acquainted with this versatile product! You get one sheet each of. EasyWeed is a polyurethane, ready-to-cut material designed for custom garment decoration. EasyWeed is in a league of its own because of its pressure sensitive carrier. This feature allows you to weed small letters and fine designs easily. 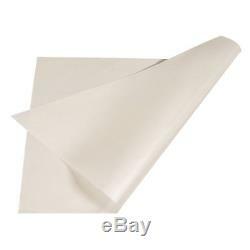 Much thinner than other film materials, EasyWeed offers excellent durability, even after repeated washings. Its great for player names and numbers or adding personalization to corporate wear. Because of its thinness, its extremely easy to cut, weed, and heat apply and is perfect for single color or multi-layered applications. This is a HOT PEEL product. This product is CPSIA certified as child safe being phthalate and lead free. Two color names and numbers. Great for uniforms and work wear. All designs must be cut in reverse. Preheat garment in heat press at 302F degrees for 4 seconds. Position EasyWeed application on garment. Heat apply at 302F degrees for 10-15 seconds, medium pressure. Please Note: Actual width of 15" roll is 14.75". Two 15" x 15" Non-Stick Sheet for Heat Presses. Non-stick sheets are great for both fabric and heat press protection for any type of heat transfer. The Non-stick protects the shirt and the press while still allowing heat to transfer the design. You can also use a Non-stick sheet and a heat press to give direct plastisol prints a glossy look and feel. These Non-stick Sheets for Heat Presses come in assorted sizes and are replacement Non-stick sheets for use with a variety of styles and sizes of heat presses. 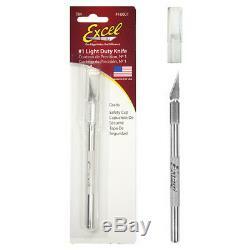 Excel #1 Light Duty Knife with Cap, Round Aluminum Handle. Excel #1 Light Duty Knife with Cap, Round Aluminum Handle with a No. 11 blade for precision cutting of lightweight materials like paper, plastic balsa, thin metal, cloth, film and acetate. 11 blade and a safety cap. 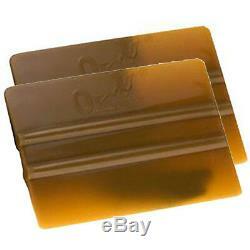 These are our most popular squeegees that are suitable for everyday use when installing vinyl. Our Price Guarantee - USCutter exists to offer its customers the best value in the market by offering the low price on all the products we carry. Our goal is to provide our customers with the equipment and supplies to make them successful, and to provide an avenue for growth by offering a growing, innovative equipment and product selection to expand into new markets. Our Purpose - USCutter exists to offer its customers the best value in the market by offering the low price on all the products we carry. Our Model - USCutter utilizes technology and innovation to offer its customers value. Our ecommerce model allows our customers to place their orders accurately and conveniently. To support our customers with their equipment and supplies, USCutter offers extensive support including an active forum, live chat, how-to videos, online manuals, and an employee-staffed call center. Community - We have a huge online forum where you can learn more and see how we are committed to improving our reputation through outstanding service and support. Reputation - We don't inflate our specifications. We just sell the best product for the lowest price. You have 30 days from the time you receive a product to initiate a return or to report a defective product. See the items below to determine the terms for your return. Any order placed with USCutter implies consent to abide by these policies. Policy displayed on individual product page takes precedence over any other policy displayed anywhere else. Any equipment older than 30 days may be replaced with a certified refurbished unit at our discretion. If the item arrived damaged, broken, or faulty, USCutter recommends that you add pictures showing any scratches or defects when sending a request for the return. Make sure your return is trackable. 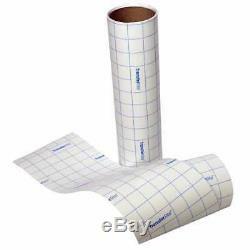 Consumable Material: Vinyl, transfer tape, and other supplies are not eligible for return once the packaging is opened. Software: Software is not eligible for return under any circumstances. If the disc is determined to be defective a digital download for the item may be supplied at the discretion of USCutter. Inks: Inks are not eligible for return once they have left the warehouse. Local pickups are not available. AL, CA, CO, HI, ID, KY, MD, MN, NC, ND, NJ, NV, OK, PA, RI, SC, SD, TN, VT, WA, WI. That the list of states above may not have been updated recently. USCutter does not accept International orders. National holidays do not count towards expected time of transit and should be calculated as an additional day of transit. 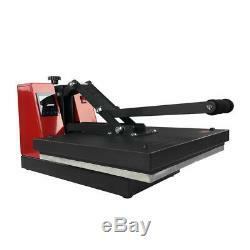 The item "USCutter Business Craft Bundle Silhouette Cameo 3, 15 x 15 Heat Press Machine" is in sale since Tuesday, August 14, 2018. This item is in the category "Crafts\Scrapbooking & Paper Crafts\Die Cutting & Embossing\Die Cut & Embossing Machines". The seller is "uscutter" and is located in Memphis, TN.